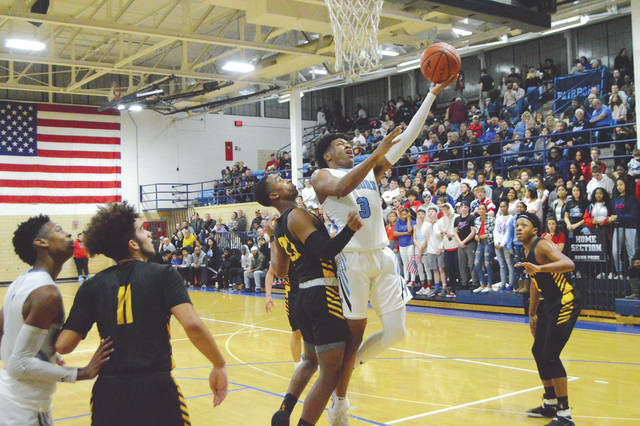 In a more holiday atmosphere on Dec. 20, 2018, Xenia’s Samari Curtis (15) drives against Fairborn’s Shaunn Monroe (3) in a Greater Western Ohio Conference battle in Fairborn. Both players were selected to the Division I All-Ohio team, with Curtis being named Player of the Year. Fairborn’s Shaunn Monroe (3) scores in a regular season win over Sidney. Monroe was selected to the Division I All-Ohio Honorable Mention team on March 20. GREENE COUNTY — There have been some competitively heated battles between Fairborn’s Shaunn Monroe and Xenia’s Samari Curtis through the years. As it turns out, the two scoring standouts both earned Division I All-Ohio recognition on March 20 by a panel of Ohio Prep Sportswriters Association media members. Curtis was named to the First Team, and was selected as the Division I Player of the Year, while Monroe was an Honorable Mention selection. While Curtis has turned in higher individual player honors, Monroe’s Skyhawks teams have fared better in the Greater Western Ohio Conference South divisional standings. The teams shared the division crown in 2016, shared second place in 2017, then Fairborn has finished second to Trotwood-Madison, just ahead of Xenia in the divisional standings, for the past two seasons. In the player’s careers at their respective schools, Xenia and Fairborn met on the basketball court nine times. Fairborn has won six of those, including the last four straight. Of those nine games, Curtis and Monroe met head-to-head five times, with the Xenia Buccaneer standout outscoring Monroe in four of those occasions. Almost appropriate to the importance both players were to their respective teams, the dueling friends each finished with 22 points in their final head-to-head meeting. Curtis finished the season with a league-best 34.1 points-per-game scoring average, 5.2 assists per game, and 2.5 steals per game, while Monroe was third in the GWOC at 24.6 points per game, had 4.6 assists per contest and was second in the league in steals per game at 4.0. In a recent interview, Curtis admitted that the two players — along with Trotwood-Madison’s Amari Davis (the Division II Player of the Year) and Sidney’s Andre Gordon — are heated GWOC rivals on the court, but they often text each other and congratulate each other on their achievements throughout the season. The four players led the GWOC in scoring with Curtis at 33.8 ppg, followed by Davis (30.1), Monroe (24.6) and Gordon (22.6). “Those guys are my great friends,” Curtis said. “We know that what goes on on the court, it’s business and we’re going to play our hearts out for our team to win. But off the court, we’re good friends. I talk to them a lot. Monroe and Curtis join Legacy Christian’s Erik Uszynski as All-Ohio selections from the Greene County area. Uszynski, a senior, was a Special Mention All-Ohio pick in Division IV this season. 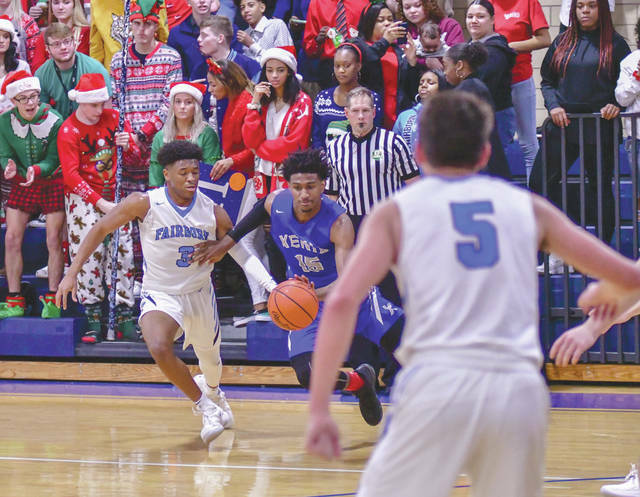 https://www.xeniagazette.com/wp-content/uploads/sites/32/2019/03/web1_CurtisMonroeSTATE_PS.jpgIn a more holiday atmosphere on Dec. 20, 2018, Xenia’s Samari Curtis (15) drives against Fairborn’s Shaunn Monroe (3) in a Greater Western Ohio Conference battle in Fairborn. Both players were selected to the Division I All-Ohio team, with Curtis being named Player of the Year. https://www.xeniagazette.com/wp-content/uploads/sites/32/2019/03/web1_MonroeGordon_PS.jpgFairborn’s Shaunn Monroe (3) scores in a regular season win over Sidney. Monroe was selected to the Division I All-Ohio Honorable Mention team on March 20. Ohio’s Mr. Basketball will be named on Thursday morning. Due to OPSWA deadline restrictions, we will have a story online on Thursday morning. The story will then run in the Fairborn Daily Herald and Xenia Daily Gazette newspapers on Friday.